It was a terrible accident, and for one moment the splendid machinery of Cranston House got out of gear and stood still. The butler emerged from the retirement in which he spent his elegant leisure, two grooms of the chambers appeared simultaneously from opposite directions, there were actually housemaids on the grand staircase, and those who remember the facts most exactly assert that Mrs. Pringle herself positively stood upon the landing. Mrs. Pringle was the housekeeper. As for the head nurse, the under nurse, and the nursery maid, their feelings cannot be described. The head nurse laid one hand upon the polished marble balustrade and stared stupidly before her, the under nurse stood rigid and pale, leaning against the polished marble wall, and the nursery-maid collapsed and sat down upon the polished marble step, just beyond the limits of the velvet carpet, and frankly burst into tears. The Lady Gwendolen Lancaster-Douglas-Scroop, youngest daughter of the ninth Duke of Cranston, and aged six years and three months, picked herself up quite alone, and sat down on the third step from the foot of the grand staircase in Cranston House. “Oh!” ejaculated the butler, and he disappeared again. “Ah!” responded the grooms of the chambers, as they also went away. “It’s only that doll,” Mrs. Pringle was distinctly heard to say, in a tone of contempt. The under nurse heard her say it. Then the three nurses gathered round Lady Gwendolen and patted her, and gave her unhealthy things out of their pockets, and hurried her out of Cranston House as fast as they could, lest it should be found out upstairs that they had allowed the Lady Gwendolen Lancaster-Douglas-Scroop to tumble down the grand staircase with her doll in her arms. And as the doll was badly broken, the nursery-maid carried it, with the pieces, wrapped up in Lady Gwendolen’s little cloak. It was not far to Hyde Park, and when they had reached a quiet place they took means to find out that Lady Gwendolen had no bruises. For the carpet was very thick and soft, and there was thick stuff under it to make it softer. Lady Gwendolen Douglas-Scroop sometimes yelled, but she never cried. It was because she had yelled that the nurse had allowed her to go downstairs alone with Nina, the doll, under one arm, while she steadied herself with her other hand on the balustrade, and trod upon the polished marble steps beyond the edge of the carpet. So she had fallen, and Nina had come to grief. “Pa,” said Nina, as her right arm was pushed down, and speaking through her broken face. It was cracked right across, from the upper corner of the forehead, with a hideous gash, through the nose and down to the little frilled collar of the pale green silk Mother Hubbard frock, and two little three-cornered pieces of porcelain had fallen out. “I’m sure it’s a wonder she can speak at all, being all smashed,” said the under nurse. Lady Gwendolen was occupied in digging a hole in the ground with a little spade, and paid no attention to the nurses. “What are you doing?” enquired the nurserymaid, looking on. “Nina’s dead, and I’m diggin’ her a grave,” replied her ladyship thoughtfully. “Oh, she’ll come to life again all right,” said the nursery-maid. The under nurse wrapped Nina up again and departed. Fortunately a kind soldier, with very long legs and a very small cap, happened to be there; and as he had nothing to do, he offered to see the under nurse safely to Mr. Puckler’s and back. Mr. Bernard Puckler and his little daughter lived in a little house in a little alley, which led out off a quiet little street not very far from Belgrave Square. He was the great doll doctor, and his extensive practice lay in the most aristocratic quarter. He mended dolls of all sizes and ages, boy dolls and girl dolls, baby dolls in long clothes, and grown-up dolls in fashionable gowns, talking dolls and dumb dolls, those that shut their eyes when they lay down, and those whose eyes had to be shut for them by means of a mysterious wire. His daughter Else was only just over twelve years old, but she was already very clever at mending dolls’ clothes, and at doing their hair, which is harder than you might think, though the dolls sit quite still while it is being done. Mr. Puckler had originally been a German, but he had dissolved his nationality in the ocean of London many years ago, like a great many foreigners. He still had one or two German friends, however, who came on Saturday evenings, and smoked with him and played picquet or “skat” with him for farthing points, and called him “Herr Doctor,” which seemed to please Mr. Puckler very much. He looked older than he was, for his beard was rather long and ragged, his hair was grizzled and thin, and he wore horn-rimmed spectacles. As for Else, she was a thin, pale child, very quiet and neat, with dark eyes and brown hair that was plaited down her back and tied with a bit of black ribbon. She mended the dolls’ clothes and took the dolls back to their homes when they were quite strong again. The house was a little one, but too big for the two people who lived in it. There was a small sitting-room on the street, and the workshop was at the back, and there were three rooms upstairs. But the father and daughter lived most of their time in the workshop, because they were generally at work, even in the evenings. Mr. Puckler laid Nina on the table and looked at her a long time, till the tears began to fill his eyes behind the horn-rimmed spectacles. He was a very susceptible man, and he often fell in love with the dolls he mended, and found it hard to part with them when they had smiled at him for a few days. They were real little people to him, with characters and thoughts and feelings of their own, and he was very tender with them all. But some attracted him especially from the first, and when they were brought to him maimed and injured, their state seemed so pitiful to him that the tears came easily. You must remember that he had lived among dolls during a great part of his life, and understood them. And Else understood him, because she was a child, and she knew that she was more to him than all the dolls. He fell in love with Nina at first sight, perhaps because her beautiful brown glass eyes were something like Else’s own, and he loved Else first and best, with all his heart. And, besides, it was a very sorrowful case. Nina had evidently not been long in the world, for her complexion was perfect, her hair was smooth where it should be smooth, and curly where it should be curly, and her silk clothes were perfectly new. But across her face was that frightful gash, like a sabre-cut, deep and shadowy within, but clean and sharp at the edges. When he tenderly pressed her head to close the gaping wound, the edges made a fine grating sound, that was painful to hear, and the lids of the dark eyes quivered and trembled as though Nina were suffering dreadfully. He always asked the names of the broken dolls when they were brought to him, and sometimes the people knew what the children called them, and told him. He liked “Nina” for a name. Altogether and in every way she pleased him more than any doll he had seen for many years, and he felt drawn to her, and made up his mind to make her perfectly strong and sound, no matter how much labour it might cost him. Mr. Puckler worked patiently a little at a time, and Else watched him. She could do nothing for poor Nina, whose clothes needed no mending. The longer the doll doctor worked, the more fond he became of the yellow hair and the beautiful brown glass eyes. He sometimes forgot all the other dolls that were waiting to be mended, lying side by side on a shelf, and sat for an hour gazing at Nina’s face, while he racked his ingenuity for some new invention by which to hide even the smallest trace of the terrible accident. She was wonderfully mended. Even he was obliged to admit that; but the scar was still visible to his keen eyes, a very fine line right across the face, downwards from right to left. Yet all the conditions had been most favourable for a cure, since the cement had set quite hard at the first attempt and the weather had been fine and dry, which makes a great difference in a dolls’ hospital. At last he knew that he could do no more, and the under nurse had already come twice to see whether the job was finished, as she coarsely expressed it. “Nina is not quite strong yet,” Mr. Puckler had answered each time, for he could not make up his mind to face the parting. And now he sat before the square deal table at which he worked, and Nina lay before him for the last time with a big brown paper box beside her. It stood there like her coffin, waiting for her, he thought. He must put her into it, and lay tissue paper over her dear face, and then put on the lid, and at the thought of tying the string his sight was dim with tears again. He was never to look into the glassy depths of the beautiful brown eyes any more, nor to hear the little wooden voice say “Pa-pa” and “Ma-ma.” It was a very painful moment. In the vain hope of gaining time before the separation, he took up the little sticky bottles of cement and glue and gum and colour, looking at each one in turn, and then at Nina’s face. And all his small tools lay there, neatly arranged in a row, but he knew that he could not use them again for Nina. She was quite strong at last, and in a country where there should be no cruel children to hurt her she might live a hundred years, with only that almost imperceptible line across her face to tell of the fearful thing that had befallen her on the marble steps of Cranston House. Suddenly Mr. Puckler’s heart was quite full, and he rose abruptly from his seat and turned away. “Else,” he said unsteadily, “you must do it for me. I cannot bear to see her go into the box.” So he went and stood at the window with his back turned, while Else did what he had not the heart to do. Else was used to her father’s queer ways with the dolls, and though she had never seen him so much moved by a parting, she was not much surprised. When Else was gone, he left the window and sat down in his place before the table again, to wait for the child to come back. He touched the place where Nina had lain, very gently, and he recalled the softly tinted pink face, and the glass eyes, and the ringlets of yellow hair, till he could almost see them. The evenings were long, for it was late in the spring. But it began to grow dark soon, and Mr. Puckler wondered why Else did not come back. She had been gone an hour and a half, and that was much longer than he had expected, for it was barely half a mile from Belgrave Square to Cranston House. He reflected that the child might have been kept waiting, but as the twilight deepened he grew anxious, and walked up and down in the dim workshop, no longer thinking of Nina, but of Else, his own living child, whom he loved. An undefinable, disquieting sensation came upon him by fine degrees, a chilliness and a faint stirring of his thin hair, joined with a wish to be in any company rather than to be alone much longer. It was the beginning of fear. He told himself in strong German-English that he was a foolish old man, and he began to feel about for the matches in the dusk. He knew just where they should be, for he always kept them in the same place, close to the little tin box that held bits of sealing-wax of various colours, for some kinds of mending. But somehow he could not find the matches in the gloom. Something had happened to Else, he was sure, and as his fear increased, he felt as though it might be allayed if he could get a light and see what time it was. Then he called himself a foolish old man again, and the sound of his own voice startled him in the dark. He could not find the matches. The window was grey still; he might see what time it was if he went close to it, and he could go and get matches out of the cupboard afterwards. He stood back from the table, to get out of the way of the chair, and began to cross the board floor. Something was following him in the dark. There was a small pattering, as of tiny feet upon the boards. He stopped and listened, and the roots of his hair tingled. It was nothing, and he was a foolish old man. He made two steps more, and he was sure that he heard the little pattering again. He turned his back to the window, leaning against the sash so that the panes began to crack, and he faced the dark. Everything was quite still, and it smelt of paste and cement and wood-filings as usual. “Is that you, Else?” he asked, and he was surprised by the fear in his voice. There was no answer in the room, and he held up his watch and tried to make out what time it was by the grey dusk that was just not darkness. So far as he could see, it was within two or three minutes of ten o’clock. He had been a long time alone. He was shocked, and frightened for Else, out in London, so late, and he almost ran across the room to the door. As he fumbled for the latch, he distinctly heard the running of the little feet after him. “Mice!” he exclaimed feebly, just as he got the door open. He shut it quickly behind him, and felt as though some cold thing had settled on his back and were writhing upon him. The passage was quite dark, but he found his hat and was out in the alley in a moment, breathing more freely, and surprised to find how much light there still was in the open air. He could see the pavement clearly under his feet, and far off in the street to which the alley led he could hear the laughter and calls of children, playing some game out of doors. He wondered how he could have been so nervous, and for an instant he thought of going back into the house to wait quietly for Else. But instantly he felt that nervous fright of something stealing over him again. In any case it was better to walk up to Cranston House and ask the servants about the child. One of the women had perhaps taken a fancy to her, and was even now giving her tea and cake. He walked quickly to Belgrave Square, and then up the broad streets, listening as he went, whenever there was no other sound, for the tiny footsteps. But he heard nothing, and was laughing at himself when he rang the servants’ bell at the big house. Of course, the child must be there. The person who opened the door was quite an inferior person, for it was a back door, but affected the manners of the front, and stared at Mr. Puckler superciliously under the strong light. The inferior person said rudely that “nothing could have happened to her in that house, because she had not been there, which was a jolly good reason why;” and Mr. Puckler was obliged to admit that the man ought to know, as it was his business to keep the door and let people in. He wished to be allowed to speak to the under nurse, who knew him; but the man was ruder than ever, and finally shut the door in his face. When the doll doctor was alone in the street, he steadied himself by the railing, for he felt as though he were breaking in two, just as some dolls break, in the middle of the backbone. Presently he knew that he must be doing something to find Else, and that gave him strength. He began to walk as quickly as he could through the streets, following every highway and byway which his little girl might have taken on her errand. He also asked several policemen in vain if they had seen her, and most of them answered him kindly, for they saw that he was a sober man and in his right senses, and some of them had little girls of their own. It was one o’clock in the morning when he went up to his own door again, worn out and hopeless and broken-hearted. As he turned the key in the lock, his heart stood still, for he knew that he was awake and not dreaming, and that he really heard those tiny footsteps pattering to meet him inside the house along the passage. But he was too unhappy to be much frightened any more, and his heart went on again with a dull regular pain, that found its way all through him with every pulse. So he went in, and hung up his hat in the dark, and found the matches in the cupboard and the candlestick in its place in the corner. Mr. Puckler was so much overcome and so completely worn out that he sat down in his chair before the work-table and almost fainted, as his face dropped forward upon his folded hands. Beside him the solitary candle burned steadily with a low flame in the still warm air. “Else! Else!” he moaned against his yellow knuckles. And that was all he could say, and it was no relief to him. On the contrary, the very sound of the name was a new and sharp pain that pierced his ears and his head and his very soul. For every time he repeated the name it meant that little Else was dead, somewhere out in the streets of London in the dark. He was so terribly hurt that he did not even feel something pulling gently at the skirt of his old coat, so gently that it was like the nibbling of a tiny mouse. He might have thought that it was really a mouse if he had noticed it. “Else! Else!” he groaned right against his hands. Then a cool breath stirred his thin hair, and the low flame of the one candle dropped down almost to a mere spark, not flickering as though a draught were going to blow it out, but just dropping down as if it were tired out. Mr. Puckler felt his hands stiffening with fright under his face; and there was a faint rustling sound, like some small silk thing blown in a gentle breeze. He sat up straight, stark and scared, and a small wooden voice spoke in the stillness. “Pa-pa,” it said, with a break between the syllables. Mr. Puckler stood up in a single jump, and his chair fell over backwards with a smashing noise upon the wooden floor. The candle had almost gone out. It was Nina’s doll voice that had spoken, and he should have known it among the voices of a hundred other dolls. And yet there was something more in it, a little human ring, with a pitiful cry and a call for help, and the wail of a hurt child. Mr. Puckler stood up, stark and stiff, and tried to look round, but at first he could not, for he seemed to be frozen from head to foot. Then he made a great effort, and he raised one hand to each of his temples, and pressed his own head round as he would have turned a doll’s. The candle was burning so low that it might as well have been out altogether, for any light it gave, and the room seemed quite dark at first. Then he saw something. He would not have believed that he could be more frightened than he had been just before that. But he was, and his knees shook, for he saw the doll standing in the middle of the floor, shining with a faint and ghostly radiance, her beautiful glassy brown eyes fixed on his. And across her face the very thin line of the break he had mended shone as though it were drawn in light with a fine point of white flame. Yet there was something more in the eyes, too; there was something human, like Else’s own, but as if only the doll saw him through them, and not Else. And there was enough of Else to bring back all his pain and to make him forget his fear. “Else! my little Else !” he cried aloud. The small ghost moved, and its doll-arm slowly rose and fell with a stiff, mechanical motion. It seemed this time that there was even more of Else’s tone echoing somewhere between the wooden notes that reached his ears so distinctly, and yet so far away. Else was calling him, he was sure. His face was perfectly white in the gloom, but his knees did not shake any more, and he felt that he was less frightened. The syllables died away in the quiet room. There was a low rustling of silk, the glassy brown eyes turned slowly away, and Mr. Puckler heard the pitter-patter of the small feet in the bronze kid slippers as the figure ran straight to the door. Then the candle burned high again, the room was full of light, and he was alone. Mr. Puckler passed his hand over his eyes and looked about him. He could see everything quite clearly, and he felt that he must have been dreaming, though he was standing instead of sitting down, as he should have been if he had just waked up. The candle burned brightly now. There were the dolls to be mended, lying in a row with their toes up. The third one had lost her right shoe, and Else was making one. He knew that, and he was certainly not dreaming now. He had not been dreaming when he had come in from his fruitless search and had heard the doll’s footsteps running to the door. He had not fallen asleep in his chair. How could he possibly have fallen asleep when his heart was breaking? He had been awake all the time. He steadied himself, set the fallen chair upon its legs, and said to himself again very emphatically that he was a foolish old man. He ought to be out in the streets looking for his child, asking questions, and enquiring at the police stations, where all accidents were reported as soon as they were known, or at the hospitals. The longing, wailing, pitiful little wooden cry rang from the passage, outside the door, and Mr. Puckler stood for an instant with white face, transfixed and rooted to the spot. A moment later his hand was on the latch. Then he was in the passage, with the light streaming from the open door behind him. Quite at the other end he saw the little phantom shining clearly in the shadow, and the right hand seemed to beckon to him as the arm rose and fell once more. He knew all at once that it had not come to frighten him but to lead him, and when it disappeared, and he walked boldly towards the door, he knew that it was in the street outside, waiting for him. He forgot that he was tired and had eaten no supper, and had walked many miles, for a sudden hope ran through and through him, like a golden stream of life. And sure enough, at the corner of the alley, and at the corner of the street, and out in Belgrave Square, he saw the small ghost flitting before him. Sometimes it was only a shadow, where there was other light, but then the glare of the lamps made a pale green sheen on its little Mother Hubbard frock of silk; and sometimes, where the streets were dark and silent, the whole figure shone out brightly, with its yellow curls and rosy neck. It seemed to trot along like a tiny child, and Mr. Puckler could almost hear the pattering of the bronze kid slippers on the pavement as it ran. But it went very fast, and he could only just keep up with it, tearing along with his hat on the back of his head and his thin hair blown by the night breeze, and his horn-rimmed spectacles firmly set upon his broad nose. On and on he went, and he had no idea where he was. He did not even care, for he knew certainly that he was going the right way. Then at last, in a wide, quiet street, he was standing before a big, sober-looking door that had two lamps on each side of it, and a polished brass bell-handle, which he pulled. And just inside, when the door was opened, in the bright light, there was the little shadow, and the pale green sheen of the little silk dress, and once more the small cry came to his ears, less pitiful, more longing. 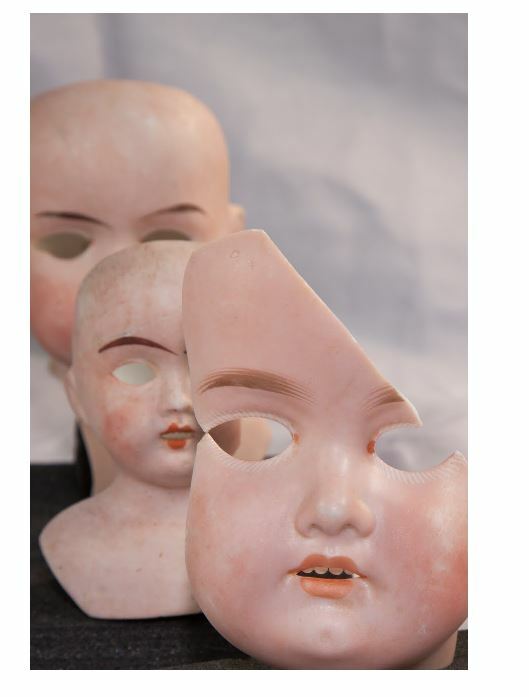 The shadow turned suddenly bright, and out of the brightness the beautiful brown glass eyes were turned up happily to his, while the rosy mouth smiled so divinely that the phantom doll looked almost like a little angel just then. “She is my little girl,” said Mr. Puckler, but he hardly heard his own voice. He leaned over Else’s face in the gentle light of the children’s ward, and when he had stood there a minute the beautiful brown eyes opened and looked up to his. Then Mr. Puckler did not know what he did or said for a moment, and what he felt was worth all the fear and terror and despair that had almost killed him that night. But by and by Else was telling her story, and the nurse let her speak, for there were only two other children in the room, who were getting well and were sound asleep. And she undid the string cleverly, but Nina was all smashed to pieces. Only the gentle light of the children’s ward made a pale green sheen in the folds of the little Mother Hubbard frock. I’ll be taking a brief holiday and will return with more Fortean fun on 5 September.